Let's say you, John Q. Reader, just bought a 2008 Lamborghini Murcielago. You go out for a drive in your new car with a special lady friend. You crash said Lamborghini. What do you do? Apparently, you get the hell out of there and leave the car behind. A 2008 Murcielago that still had temporary plates on it was crashed in La Jolla, California late last night. Instead of calling the cops and taking care of business, the occupants of the car took off. 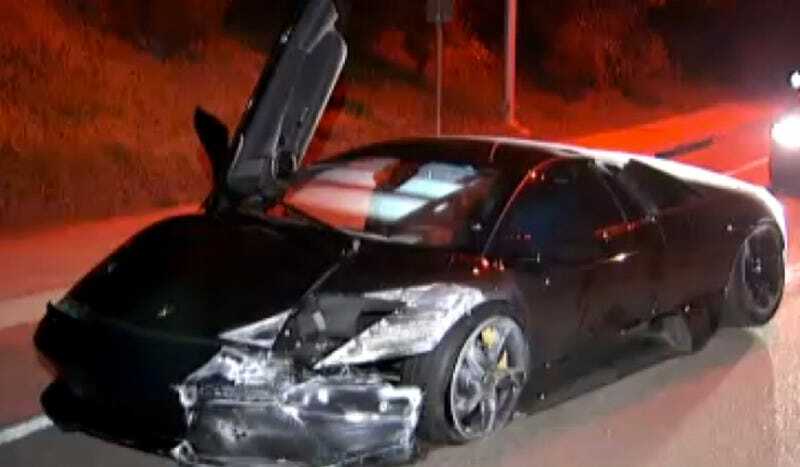 Y'know, as one that's just crashed an incredibly expensive exotic supercar in California tends to do. Or perhaps they were running away before it caught fire, since supercars seem to like to do that? A witness said they saw two people leave the car. One was a blonde woman "believed to be in her 50s wearing a black hoodie" and the other was a man shorter than the woman. Cops are looking for them. So basically you're looking for a short dude with a slightly taller blonde woman. How hard could that be to find in California? I hope to one day be rich enough to crash a Murcielago or a similar supercar and then be able to just say "screw it" and leave it at the side of the road. It must be nice.